Without him, Sherlock would be homeless and maybe a member of his own network. And Irene Adler’s bedroom would never have this elegant look. He develops and creates apartments and tube waggons only to be blown up. He spots the ultimate locations and modifies them into unique exciting sets. She does a job every fangirl wants to have. At least for a day. She is allowed to tousle Sherlock’s hair as she likes. Twist and diffuse, you’ll find out…. She creates amazing make-ups like bullet shots or scars that hurt when just looking at them. We had the chance to meet the brilliant power couple Arwel Wyn Jones, Production Designer of Sherlock, and Claire Pritchard-Jones, Hair and Make-up-Designer at Sherlock. And just let us say – they are not less amazing than their works. What we like to know first is how did they manage to get such a cool jobs. “[…]The only way to get in there was to keep studying and attending courses that were relevant”, Claire explains. She wanted to join the BBC since her early youth and therefore moved to London to make her way. Eventually, her dream became true when “I was accepted at the BBC for an apprenticeship scheme which is sadly finished now.“, she regrets. “I worked 2 years as an apprentice there and then was employed by them.“ Skills combined with a little bit of luck. We ask why the set, especially the flat at 221B, was changed quite noticeable after the pilot. “There are numerous reasons for it”, Arwel tells us, continuing: “The brief itself was different but also it was a co-work […] so it wasn’t just me. […] It was very much a Sherlock traditional story with elements of the 21st century. But when they shot the pilot […] and watched it, one of the main things they saw was that actually it worked very much better when it was the 21st century story.” The brief needed to be changed and Arwel had “a completely blank canvas to start again with the set. [though] We couldn’t afford to discard the set completely so I had to work within some parameters”, Arwel remembers. But it wasn’t only the set that got adjusted, also Sherlock changed within the new episodes. Claire tells us: “All Steven and Mark said to me was Byronesque. [She refers to Lord Byron] They wanted him to look like a poet. […] he was a creature of the night, so he [Mark] wanted his complexion very pale.” Benedict’s rough time schedule didn’t make it easy for Claire. And for each new series she had to deal with what previous productions had left over. Moreover, Benedict’s hair had grown again for each new series to get the length everyone loves with Sherlock. Arwel hardly gets any requirements, just a kind of overall impression on how the set should look like. Some elements are defined or must be on-site, such as e.g. a window, because it is needed for a particular scene, “but“, Arwel says “the overall look I’ve been very lucky – they have always trusted me very much. But you collaborate with the directors as well so I don’t just go this must be the way it is. […] And more often they go out like “alright, ok, that’s nice”. Both do not get any information about the cast in advance. The moment it’s announced Claire has about 2 to 3 weeks preparation time, including the reading of the script and all previous meetings with producers and directors to clarify the particular atmosphere of an episode. Yes, this is sometimes quite stressful, as she faces right now working as make-up and hair-designer on the new Doctor Who episodes. 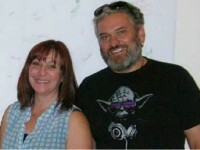 Time was going by too fast, we’d wished we could have talked to Claire and Arwel for a bit longer. They both are lovely and inspiring, doing such great jobs and remaining that humble and down-to-earth at the same time. We unfortunately had to finish the interview as they had to leave for the Baker Street Vienna Convention* where Arwel did an exciting panel and Q&A upon his work. You can watch Claire’s and Arwel’s panel right here. Meanwhile let’s just end up here with Claire’s wonderful anecdote about her little tweet “twist & diffuse”. 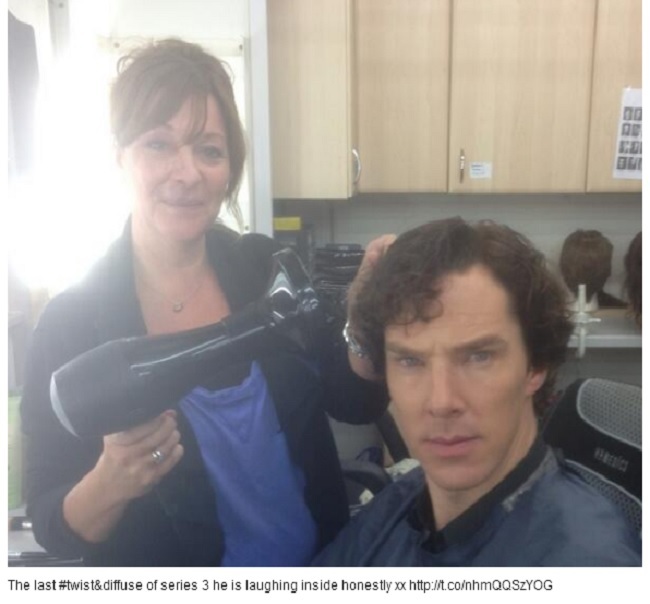 When just doing Benedict’s hair she was asked what kind of awesome job she was doing right at the moment – and while Benedict was just sitting there reading the script while getting his curly Sherlock hair made by Claire, she tweeted for short: “twist and diffuse”. And she could not imagine what kind of an explosion on twitter she caused by those three single words…. She still smiles upon that and yet can’t believe. Watch out the whole interview – enjoy! * The first Sherlock Holmes Convention Baker Street Vienna took place from 14 to 15 June 2014 at Vienna. To get further information about this year’s Convention visit Baker Street Vienna.